Konchalovsky – Russian and Soviet artist, known for his still lifes and portraits. He worked in the style of post-impressionism, cubism, fauvism, was the chairman of the association of artists “The Jack of Diamonds”. Members of this association denied academic painting and realism, putting their own perception of this reality above reality. The play on words of the name is funny, in those years it sounded quite unambiguously – “convicts of diamonds” were called convicts, mostly political, who were distinguished by a robe with a black rhombus on their backs. The name also refers to the word “walt”, which was slang and meant “roguish”, “quirky”. In general, the name was obtained, which should have caused the average inhabitant to be wary, surprised, hypocritical condemnation or a splash of fun, which to some extent testifies to Konchalovsky’s peculiar humor. 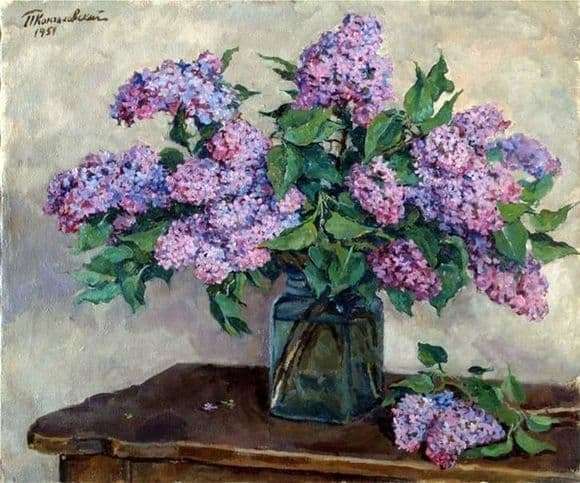 “Lilac” – one of his still lifes, which absorbed all the features that distinguish the artist’s work. Here and attention to detail, and accuracy, and exaggerated-radiant realism – you can see every little flower in the inflorescence, water in a vase, fallen petals. The lilac in the picture looks alive, and the imagination itself draws a story to it. For someone – about the child who presented the bouquet to the mother, for someone – about the young lover who brought a touching bouquet of the first lilac to his lady, for someone about an old man who wants to please his sick wife. Lilac seems real, it seems that you can feel its fragrance, and the peculiar multidimensionality of the picture (you can invent stories, you can remember the best of the springs of your life, you can just admire the flowers, without thinking about anything) adds to her charms as well as any of her details.